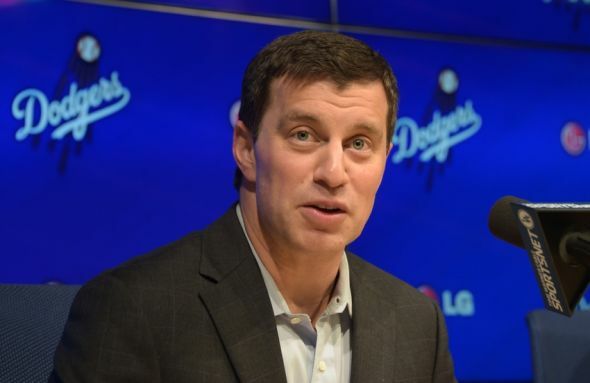 I have no isolated insight, no secret sources, no magic metrics on the Dodgers flurry of activity under the Andrew Friedman/Farhan Zaidi/Josh Byrnes regime. What I do have is an objective fan’s outlook about both the Chavez Ravine management team and the club that will perform there this coming summer (and autumn). I first want to address Matt Kemp, as he is the largest name involved in these transactions. For me, I’ve enjoyed his talent but have not consistently praised him as some (many) have. With effortless speed & power, we saw what Kemp could do – nearly a 40/40 season in ’11 when he finished second in MVP to Ryan Braun (Granada Hills HS). We saw the precociousness after the ferociousness, literally moping upon his move to left field. He was disinterested at times, downtrodden at others, and along with Andre Ethier, formed a really needy core. Especially for really good players. Both of these guys needed to play, but they also needed to be loved. Ethier was nearly despised by some fans, though that chapter will be closed come January or February, when Friedman engineers that deal. In fact, I think both Ethier and Crawford are going to be moved prior to the first pitch of 2015, with management taking a wrecking ball to The Team That Ned Built. But I digress. . .We know Kemp is an undeniable talent, and in fact – I think he will play well in San Diego. The relaxed environ, the spacious field for him to gallop in Center and Right, the Man status; this will all play well to his soul, and he’ll perform. Plus, .280/25/90 on the Padres is performing, so good for him. And good for the Dodgers. I don’t think the overhaul is so much due to lack of capable ballplayers on Colletti’s roster; I think the entire club ethos needed to change. Letting Hanley walk, and I LOVED Hanley, was a must. He was the most exciting hitter I’d seen at Dodger Stadium since another Ramirez (99 on his jersey), and has a laserbeam line drive ability (I’m talking absolute screamers, check out his 2013 homer in San Diego, coincidentally) that I’d only seen previously with Gary Sheffield. But he had to go. He needs to have the option to DH, and the Dodgers needed to look for a real shortstop. That bat is irreplaceable, but he commanded too many years; 120 games played would soon be his highwater mark, and the Dodgers don’t need that albatross. One deal that went nearly unnoticed is the acquisition of Joel Peralta. A professional; unspectacular and easily overlooked, Peralta is more a signal than anything – the bullpen is not a place to invest outside the organization. You can make prudent acquisitions, guys that will calm the ship, eat innings & understand their roles, but as evidenced by the Royals, Giants and Cardinals, you need to build your bullpen from within. Develop guys as starters in the minor leagues and let them hit their preordained innings mark through a variety of roles. But honing in on the pen – especially during formative years – is the most productive way to build pitchers and a safety net. The Cardinals, in my mind, pioneered this with Adam Wainwright (he was their closer during the ’06 pennant run), converted Rosenthal to perma-pen status, but have brought up the youngsters this way. It’s smart, and it needs to be stated – the bullpen is for guys that aren’t good enough to be starters; they are inherently worse than the guy they’re replacing. Or at least that’s how it was, and why so many bullpens implode. But if you use it as a platform for your best arms, you’re making the bullpen a strength. It makes a ton of sense, and that, along with LaRussa’s inning specialization, will make the biggest impact on the makeup of ballclubs in the last half century. In short, the Dodgers simply had too many old, crappy arms on the books (Wilson, League, Perez), which weren’t allowing the maligned Scott Elbert, the injured Chris Withrow, and the overlooked Paco Rodriguez to slide into natural roles that could have enhanced the team. I think that Peralta and Friedman acquisition Juan Nicasio will provide a stopgap for the pen while they’ll look to build in 2016 and beyond from the inside, which was luckily left fruitful by Logan White. we have a huge budget and aren’t afraid to use it, but we realize that the future is built on the backs of SABR-minded individuals that also understand that baseball is, and always will be, based on the eyeball test. Which brings me to Dee Gordon. Talk about a likable ballplayer; always smiling, always improving, a genuine good person on and off the field. Dodger fans loved his improvement this year, after teetering on the precipice of being a 4A player. “He was an All-Star,” they’d say. Shoot, I said it too. He was exciting. Sixty four stolen bases this year! But the dude couldn’t hit, and I worry that he’d end up being a .262 guy with no pop, and – well, there’s a reason Pat Listach didn’t have a long career. I wish him well in Miami, but most of all I thank him for turning into Andrew Heaney (who’s going to be damn good, ps, and really made me crack up on Twitter), who was flipped for Howie Kendrick.I’ve always likened Howie Kendrick to Kirby Puckett, my favorite player growing up. Free swinging, joyous dudes that came out of junior colleges to light up the big leagues with their smiles & their sticks. Kendrick, of course, isn’t the hitter Puckett was but he can swing it. Especially for a second baseman – and in my mind, the jump offensively from Gordon to Kendrick offsets the perceived drop from Ramirez to Rollins on the other side of the second base bag. Kendrick has a decent glove, and with only one year left on his contract leaves the Dodgers with options heading into 2016, the first real year of the new regime. Lastly, the Dodgers aren’t done. I don’t know if that means David Price, Cole Hamels, Jordan Zimmermann, James Shields or all of the above (just kidding, I think?). I do think that Yasiel Puig and Clayton Kershaw are untouchable, and Adrian Gonzalez, Kenley Jansen & AJ Ellis aren’t going anywhere. Anything else is up for discussion.